FREMANTLE Dockers players held a football clinic at Rushton Park North on Tuesday, June 16. The aim of the clinic was for Dockers players to encourage and advise local girls’ football team members. 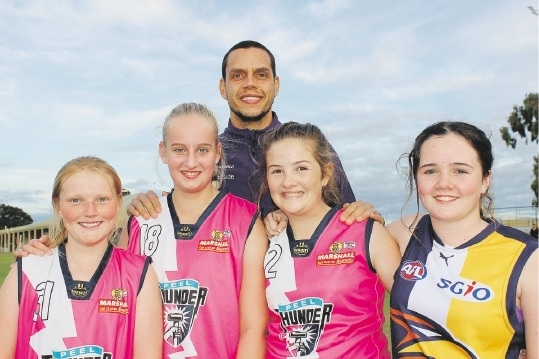 Fremantle Dockers player Michael Johnson is pictured with Pinjarra Football Club members Bree Morrison, Lily Brereton, Kelsi Bartley and Maddison Mudge. FREMANTLE Dockers players held a football clinic at Rushton Park North on Tuesday, June 16. The aim of the clinic was for Dockers players to encourage and advise local girls’ football team members.